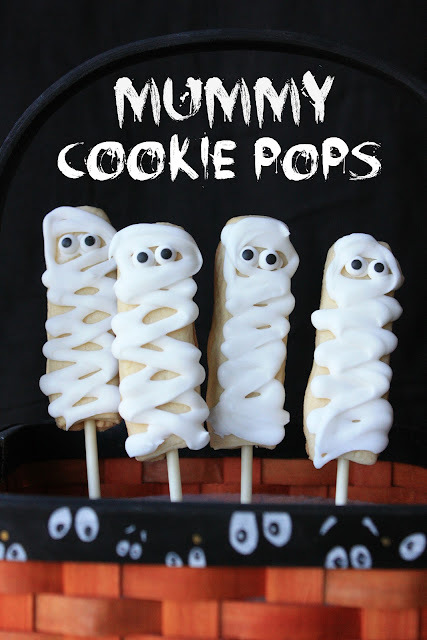 These mummy cookies came into play today as I realized that I had some sugar cookie sticks (on-a-stick) hanging out in my kitchen (the remnants of an idea that didn't work), along with some fresh royal icing. Hmmm, what to do, what to do? Then I remembered Meaghan's (The Decorated Cookie) recent post: Monster Cookie Sticks...simple and cute! These are the perfect little snack size sweet treats! So super cute!! I love the cookies on a stick and these are so cute. I love the candy eyes! Fabulous! I'm sure I'd end up having a little mummy puppet show! Oh, I hope you do a Santa (with beard) version for Christmas! Thank you for this cute idea. I have decided those candy eyes are my new favorite must have! I love them. Your cookies are adorable! I am big fan of your cookies, but these are so so cute. I love this Sue! Quick and easy is what I need these days! Sometimes simple is the cutest anyway! And btw, I love how you style your photos!!! Beautiful! Oh gosh, what cute idea! This is super creative.